The 1979 explosion at PKO Bank Polski’s Rotunda office in Warsaw took place on February 15, 1979, at 12:37 p.m. As a result, 49 people died and 135 were injured. Officially, the tragedy was caused by a gas explosion,  but in the course of time much speculation appeared, and Varsovians talked among themselves that the building had been blown up by a bomb. Furthermore, to many the explosion served as a harbinger of future changes in Poland. Powszechna Kasa Oszczędności Bank Polski Spółka Akcyjna is Poland's largest bank. It provides services to individual and business clients. The core business activity of PKO Bank Polski is retail banking. The full name Powszechna Kasa Oszczędności roughly means "General Savings Bank," and Bank Polski means "Polish Bank." Popularly only the acronym is used. PKO Rotunda is a rotunda-type building owned by the PKO BP bank in the center of Warsaw, Poland. Designed from 1960–1969 by chief architect Jerzy Jakubowicz, it was the site of the 1979 Warsaw gas explosion. Soon in October 1979 it was rebuilt and opened again. Warsaw is the capital and largest city of Poland. The metropolis stands on the Vistula River in east-central Poland and its population is officially estimated at 1.765 million residents within a greater metropolitan area of 3.1 million residents, which makes Warsaw the 8th most-populous capital city in the European Union. The city limits cover 516.9 square kilometres (199.6 sq mi), while the metropolitan area covers 6,100.43 square kilometres (2,355.39 sq mi). 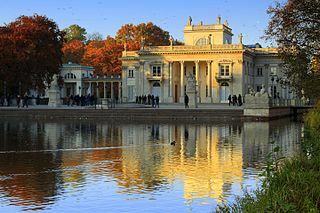 Warsaw is an alpha global city, a major international tourist destination, and a significant cultural, political and economic hub. Its historical Old Town was designated a UNESCO World Heritage Site. The winter of 1978/1979 was very harsh in Poland, and due to the extreme temperatures and heavy snowfall it was dubbed “the winter of the century”. Transport in the country came to a standstill, in poorly heated apartments in Warsaw the temperature at night dropped to 7 degrees Celsius, public mood was at a very low level, and the Warsaw poet Tomasz Jastrun, who kept a diary at that time, said: "People were expecting changes. They were convinced that the current situation had to come to an end, and something would happen. Before the change, people said, there would be signs. One of these signs was the Rotunda explosion”. Satirist Michał Ogórek has said that the explosion was a reflection of the gloomy, chaotic and cold period in Polish history. Marszałkowska is one of the main thoroughfares of Warsaw's city center. It links Bank Square in its north sector with Plac Unii Lubelskiej in the south. The central location of the Rotunda in the city made an immediate search and rescue operation possible. Altogether 2,000 people participated in it, commanded by Edward Gierski of the Warsaw Fire Department. Day after day, new bodies were recovered from the ruins. On February 17, four victims were found, on February 19, two. Apart from the firefighters and ambulances crews, passers-by also helped. Blood was donated in a temporary medical office, located at the nearby Hotel Forum (currently Novotel Warszawa Centrum). The Zodiak restaurant offered hot meals to the rescuers, hundreds of liters of blood were collected, and witnesses remember terrifying scenes, such as a woman in a blue dress, without an arm. Crowds gathered around the Rotunda, and the place of the explosion was cordoned off by the police. Documents and bills were flying in the air, and the building looked as if it had been bombed. The real cause of the explosion was a gas leak from a damaged pipe located underneath the sidewalk. The gas got into an underground telephone connection and gathered in the basement of the Rotunda. Frozen water and snow clogged all the air vents, and in those circumstances, one spark or the turning on of a light in the basement, was enough to ignite the powerful explosion. The Rotunda itself did not have a gas connection. The low temperature caused the odorant to condense, and nobody was warned of a leak. A list of victims was published in all the Warsaw newspapers, and condolences were sent by Edward Gierek and Leonid Brezhnev. Every year on the anniversary of the explosion, the management of PKO Bank Polski organizes a special celebration, which is attended by families of the victims, Warsaw authorities and the bank’s managers. Furthermore, there is a commemorative plaque, placed in the northern wall of the complex. Edward Gierek was a Polish communist politician. Gierek replaced Władysław Gomułka as first secretary of the ruling Polish United Workers' Party (PZPR) in the Polish People's Republic in 1970. He is known for opening communist Poland to Western influence and for his economic policies based on foreign loans, which ultimately failed. He was removed from power after labor strikes led to the Gdańsk Agreement between the communist state and workers of the emerging Solidarity free trade union movement. The Polish People's Republic was a state in Central Europe that existed from 1947 to 1989, and the predecessor of the modern democratic Republic of Poland. With a population of approximately 37.9 million inhabitants near the end of its existence, it was the most populous state of the Eastern Bloc after the Soviet Union. Having a unitary Marxist–Leninist communist government, it was also one of the main signatories of the Warsaw Pact. The official capital since 1947 and largest city was Warsaw, followed by industrial Łódź and cultural Kraków. The Monuments to the Warsaw Uprising were first established in Warsaw in the 1970s. Prior to that, there were only monuments to the Red Army soldiers and the Armia Ludowa soldiers. The role of the latter in the city fights in 1944 was exaggerated and overrated. Most of the victims of the Uprising who were buried in graves all over the city were later exhumed and buried in mass graves far away from the city centre, with a small concrete monument to "the victims of the war with Nazism". No mention of the Uprising was allowed. Zielone Wzgórza is one of the districts of the Polish city of Białystok. The Humberto Vidal explosion was a gas explosion that occurred on November 21, 1996 at the Humberto Vidal shoe store located in Río Piedras, Puerto Rico. The explosion killed 33 and wounded 69 others when the building collapsed. It is one of the deadliest disasters to have occurred on the island. Jan Krzysztof Kelus, also known by his initials JKK, is a Polish singer, poet, composer, and a member of the democratic opposition in Poland between the 1960s and 1980s. A professional sociologist, Kelus is best known for a number of ballads which gained him a nickname of the Bard of the opposition and Polish Woody Guthrie. Hiroshima Peace Memorial Park is a memorial park in the center of Hiroshima, Japan. It is dedicated to the legacy of Hiroshima as the first city in the world to suffer a nuclear attack, and to the memories of the bomb's direct and indirect victims. The Hiroshima Peace Memorial Park is visited by more than one million people each year. The park is there in memory of the victims of the nuclear attack on August 6, 1945. On August 6, 1945 the US dropped an atomic bomb on Hiroshima Japan. The Hiroshima Peace Memorial Park was planned and designed by the Japanese Architect Kenzō Tange at Tange Lab. June 1976 is the name of a series of protests and demonstrations in People's Republic of Poland. The protests took place after Prime Minister Piotr Jaroszewicz revealed the plan for a sudden increase in the price of many basic commodities, particularly foodstuffs. Prices in Poland were at that time fixed, and controlled by the government, which was falling into increasing debt. On February 10, 1971, textile workers in the central Polish city of Łódź began a strike action, in which the majority of participants were women. These events have been largely forgotten because a few weeks earlier, major protests and street fights had taken place in the cities of northern Poland. Nevertheless, the women of Łódź achieved what shipyard workers of the Baltic Sea coast failed to achieve - cancellation of the increase in food prices, which had been introduced by the government of Communist Poland in December 1970. Consequently, it was the only industrial action in pre-1980 Communist Poland that ended as a success. Stanisław Jaros was a Polish electrician who was executed for carrying out two assassination attempts of Polish Communist leader Władysław Gomułka, and one attempt to kill Soviet leader Nikita Khrushchev. On 31 January 2013 in Mexico City, an explosion caused by a gas leak occurred beneath Building B-2 at the Torre Ejecutiva Pemex, a skyscraper complex that is the headquarters of Pemex, the Mexican state oil company. At least 37 people died and another 126 were injured when an explosion occurred in a building adjacent to the main tower. Earlier in the day, Pemex sent out a tweet saying that the building was being evacuated due to a "problem with the electrical system" in the complex that includes the skyscraper. The Defence, Lahore explosion was a blast that took place on 23 February 2017 in a commercial market in Y-block of Defence, Lahore. The timing of the explosion is said to be around 10:00. Wikimedia Commons has media related to 1979 Warsaw gas explosion .